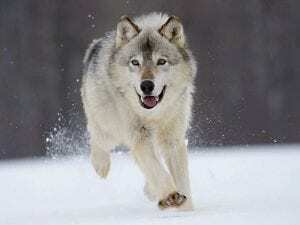 The Gray Wolf, also called Timber Wolf, is the largest wild member of the canidae family… and an ice age survivor originating during the late pleistocene, around 300,000 years ago. Wolves use several vocalizations for the purpose of communication. howls, yips, squeals, growls, chirps, and barks. The best known is the howl, which is used to notify other pack members or other packs of their location, to attract potential mates, to rally the pack before a hunt, to announce alarm at the presence of an intruder, and to express distress (pups often howl when they are stressed). In general, howling is used as a means of long distance communication. For short range communication, wolves use scent marking. Who is the Gray Wolf? How big is a Gray Wolf? Ungulates (large hoofed mammals) like elk, deer, moose and caribou. Also known to eat beaver, rabbits and other small prey. Wolves are also scavengers and often eat animals that have died due to other causes like starvation and disease. How many wolves are there, anyway? Where do wolves live? Where could I go to see one? Wolves were once common throughout all of North America but were killed in most areas of the United States by the mid 1930s. Today their range has been reduced to Canada and the following portions of the United States: Alaska, Idaho, Michigan, Minnesota, Montana, Wisconsin and Wyoming. Mexican wolves are found in New Mexico and Arizona. Thanks to the reintroduction of wolves in 1995, Yellowstone National Park is one of the most favored places to see and hear wolves in the native habitat. How do wolves live? Are they intelligent animals? Wolves live, travel and hunt in packs of 4-7 animals on average. Packs include the mother and father wolves, called the alphas, their pups and several other subordinate or young animals. The alpha female and male are the pack leaders that track and hunt prey, choose den sites and establish the pack’s territory. Wolves develop close relationships and strong social bonds. They often demonstrate deep affection for their family and may even sacrifice themselves to protect the family unit. Can wolves communicate with one another? Wolves have a complex communication system ranging from barks and whines to growls and howls. While they don’t howl at the moon, they do howl more when it’s lighter at night, which occurs more often when the moon is full. Error: Error validating access token: Session has expired on Friday, 22-Mar-19 12:26:11 PDT. The current time is Sunday, 21-Apr-19 03:52:06 PDT.